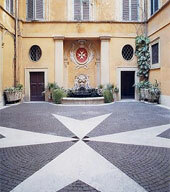 The Sovereign Order of Malta is a sovereign subject of international law. The Order has its own Government, an independent magistracy, bilateral diplomatic relations with 104 countries and is granted the status of Permanent Observer in many international organisations, such as the United Nations. Its operational activities are managed by the six Grand Priories, six Subpriories and 47 National Associations of Knights in the five continents. The Order issues its own passports and stamps and creates public institutions, endowed with independent juridical personality. Order’s life is governed by the Constitution and the Code, reformed in 1997. The Grand Master governs the Order both as sovereign and religious head. He is elected for life, within the professed knights in perpetual vows. He is assisted by and presides over the Sovereign Council, which is composed of four high offices – Grand Commander, Grand Chancellor, Grand Hospitaller, and Receiver of the Common Treasure – as well as six other members, all elected by the Order’s Chapter General for a five-year term. The Council of Government and the Board of Auditors, whose compositions reflect the international character of the Order, assist the Grand Master and the Sovereign Council. The Chapter General also elects these two bodies for a five-year term. Rests with the Grand Master and Sovereign Council for non-constitutional matters; with the Chapter General, representing the Supreme Assembly of Knights, as far as constitutional rules are concerned. Rests with the Sovereign Council, chaired by the Grand Master and composed of ten Knights elected by the Chapter General. It is exercised by the Magistral Courts of First Instance and of Appeal, composed of judges appointed by the Grand Master and the Sovereign Council from Order members of legal expertise. Rests with the Grand Master and Sovereign Council for non-constitutional matters; with the Chapter General, representing the Supreme Assembly of Knights, as far as constitutional rules are concerned.